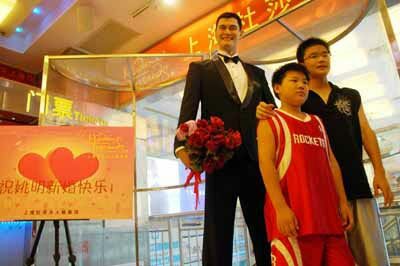 On August 6, 2007, the Shanghai Madame Tussaud's Wax Museum dressed Yao Ming's wax figure with a tuxedo. In the background music from the Chinese pop song Marry Me Today floated over the air. Holding fragrant roses, the wax "Yao" smiled to celebrate this significant day. Two visitors pose for a photo in front of the wax figure of Yao Ming in a tuxedo which made debut at Madam Tussauds' Wax Museum on Nanjing Road, east China's Shanghai Municipality on August 6, 2007. The wedding ceremony took place in Shanghai, inside the Pudong Shangri-La Hotel's China Hall. From 9 AM onwards, both hotel staff and wedding ceremony planners began to prepare for the banquet. Nine tables holding eight guests each were set up. Hotel staff dressed in identical uniforms; security guards patrolled the hotel to make sure it stayed a private ceremony. The ceremony began at 6 PM. China's top jazz singer, Tian Guo'an, began singing classical English songs as the soon-to-be-wed couple's relatives and friends stepped into the hall. Yao, dressed in a special tailor-made swallow-tailed coat, stood at the corner of the red carpet and waited for his bride Ye Li to emerge from several clusters of lilies. Groomsman Shen Wei, used to wearing sports suits, had to wear a business suit instead. Shen said that, standing beside Yao, he could indeed feel the groom's heartbeats. As one of Yao's best friends, Shen said, "The wedding was as effortless as Yao himself." At the Chinese-style ceremony, Shen drank a lot in Yao's place; he feared that if Yao drank too much it could affect his health and his performance in later competitions. The wedding ceremony reached a climax when Yao carried his bride on his back and moved around the hall in a circle in accompaniment to a comic song. Everyone burst into laughter. 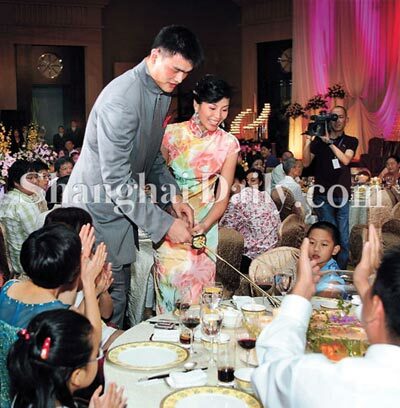 Basketball player superstar Yao Ming and his wife, Ye Li, light a candle during a very private wedding ceremony at the China Hall of the Pudong Shagri-La hotel on August 6, 2007. Shen said, "Ye is the first and the only girl Yao ever dated." In Shen's opinion, Yao is an introvert. He has never rashly dated any girl. "If he dated any one, she must be his true love." Yao kept saying that he never imagined Ye was after his fame or money. "We have known each other since we were teenagers." In 1997, Yao aged at 17 met Ye of 16 for the first time at the Shanghai Juvenile Sports School. In 1998, Yao met Ye again at the training grounds of the Shanghai municipal team. Yao showed Ye some basketball skills and invited her to go see some films. In 1999, Yao was elected to participate as a member of China's national team during the Sydney Olympics. He saw Ye again when he was in training. At this time Yao began to collect women's basketball photos with Ye in them. When participating in the Sydney Olympics, he collected more than 200 team emblems because "Ye liked them." Yao said, "I chose the best 50 emblems as the gift for her 19th birthday. She accepted both my gift and me. And actually I kept the other 150 in case she had refused me." In 2002 the NBA recruited Yao. On Valentine's Eve, Ye wove two red rope bracelets, signifying love. Ye wore one on her right wrist; Yao wore the other on his left wrist. When he joined the Houston Rockets, Yao chose number 11 as his number instead of 13, his number on China's national team. He chose 11 because Ye's number is 11. At the closing ceremony of the 2004 Athens Olympics the couple appeared together and publicly declared their love. NBA star Yao Ming and his fiance Ye Li pose in their official wedding portrait in Hangzhou, China in this photo released August 6, 2007. Yao once said to Shen that Ye was the person who truly witnessed his growth. Shen said because of the media's constant coverage, the two lovers were at odds to find any private places for dating. They could only chat at home or go for a midnight film. "They should marry each other since they experienced so much together." To Shen, Yao is not a super star; rather he is a close friend. They met when Yao enrolled in the Shanghai youth basketball team in the summer of 1994. Shen had already arrived half a year earlier. After the indescribably hard training, the two boys wanted to play games. Though Yao's family is quite poor, his mother had bought him a then popular game player, bringing the boy great joy. They often sneaked out of the dormitory to play games at the Internet café and even slept there sometimes. Yao liked to play teamwork games, such as Red Alert and Star Craft. Currently he prefers the World of Warcraft. The two friends, one in Houston and another in Shanghai, would conduct virtual fights side by side in cyberspace. The Shanghai Dongfang team retired Shen in 2002 due to injury and sickness. He isolated himself and refused to communicate. Through Yao's mutual friend he landed a slot as a coach in a sports school. During this period, Yao phoned several times to the coach of Shanghai Dongfang team and promoted Shen, saying: "He really did a good job." However, every time he called up his buddy, Yao only asked about his friend's health and never confessed his covert help. Currently, Yao has become his most important career helper. He directly informs Shen of the most advanced and efficient NBA strategies.